U. KANSAS (US)—A recent trip into low-Earth orbit has shown just how much monarch butterflies depend on gravity. 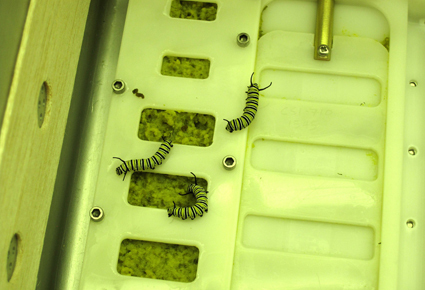 A trio of caterpillars from the University of Kansas spent more than 25 days at the International Space Station, becoming the first of their species in space. “We wanted to try to learn as much as we could about this insect and how it functions in space,” explains Chip Taylor, professor of ecology and evolutionary biology and director of Monarch Watch, a University of Kansas-based network of students, teachers, volunteers, and researchers. The three caterpillars fed, molted, pupated, emerged, and finally expired in an experimental habitat, influenced by microgravity at every stage, Taylor says. Without ordinary gravity, the caterpillars chose unpredictable surfaces for pupation and then curled into tight “C” shapes with the head of the caterpillar brought close to the abdomen, rather than assuming the normal “J” shape. The microgravity environment appeared to influence the insects increasingly as their development progressed. “Although all three caterpillars were able to shed their skin, in two cases the skin formed a cap at the end of the abdomen and the cremaster was not withdrawn from this skin and inserted into the silk pad,” says Taylor. Upon emerging from the chrysalises without normal gravitational forces, the butterflies had to force the wings to assume a flat aspect. “Pumping fluid into the wings did not seem to be sufficient in itself for the monarchs to extend their wings directly over their backs,” says Taylor. Two of the butterflies were able to expand their wings, not perfectly, but well enough so that if on Earth, they would have been able to fly. The wings of the last butterfly to emerge did not form normally. “This deformity might have been due to the imperfect form of the chrysalis as much as to the conditions in space,” explains Taylor. Observations of the insects opens doors to fresh questions and new areas of inquiry, Taylor says. “The overall results and the well-known patterns of monarch behavior on Earth indicate that monarchs have a sense of gravity,” he explains. “This conclusion raises the most interesting question of all: How do monarch caterpillars and adults sense gravity and where is the gravity sensor—or sensors—located?